Prepared a short read archive (SRA) submission for archiving our Olympia oyster genotype-by-sequencing (GBS) data in NCBI. This is in preparation for submission of the mansucript we’re putting together. I followed my outline/guideline for navigating the SRA submission process, as it’s a bit of a pain in the neck. Glad my notes were actually useful! 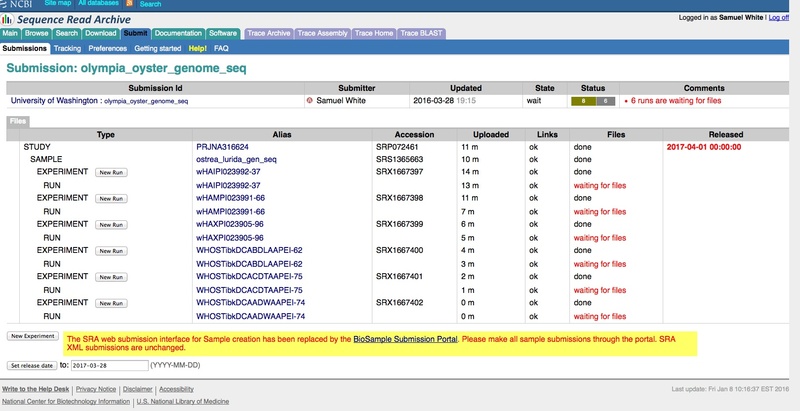 Adding our Olympia oyster genome sequencing (sequencing done by BGI) to the NCBI Sequence Read Archive (SRS). The current status can be seen in the screen cap below. Release date is set for a year from now, but will likely bump it up. Need Steven to review the details of the submission (BioProject, Experiment descriptions, etc.) before I initiate the public release. Will update this post with the SRA number once we receive it. Paired-end sequencing files were uploaded together within a single “Run”. 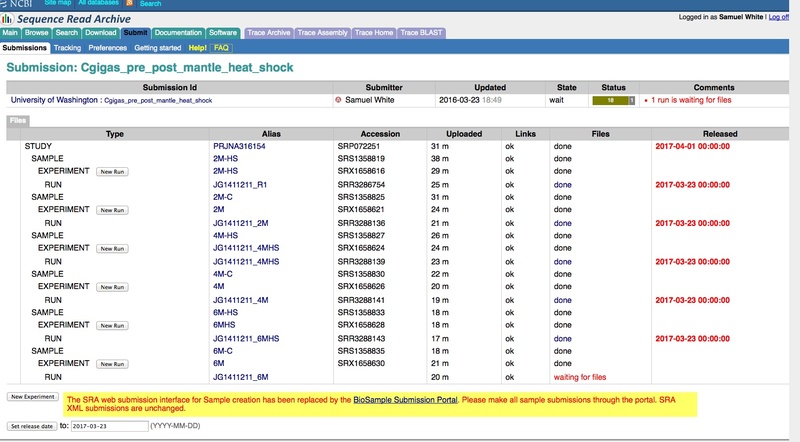 Adding our geoduck genome sequencing (sequencing done by BGI) to the NCBI Sequence Read Archive (SRS). The current status can be seen in the screen cap below. Release date is set for a year from now, but will likely bump it up. Need Steven to review the details of the submission (BioProject, Experiment descriptions, etc.) before I initiate the public release. Will update this post with the SRA number once we receive it. Mate pair sequencing files were uploaded together within a single “Run”. RNA-seq experiment conducted by Claire in 2013. She sampled mantle tissue from three adult oysters, allowed them to recover from the sampling (one week?) and then subjected those same oysters to a 1hr heat shock at 40C and collected mantle tissue from them again. As this is our first Small Read Archive (SRA) submission in many years, I decided to submit these to the SRA due to the small number of samples (6) from the Illumina sequencing we had done to make sure it was manageable. An overview of the basic SRA submission process is here. The current status can be seen in the screen cap below. Current release date is set for a year from now, but will likely bump it up. Need Steven to review the details of the submission (BioProject, Experiment descriptions, etc.) before I initiate the public release. Will update this post with the SRA number once we receive it.